I am so in love with this crochet owl cozy! 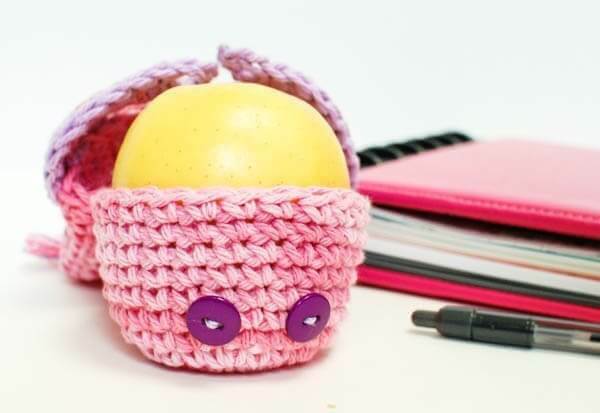 Last week I shared an “apple” apple cozy which has since been claimed by my daughter. I also made little monster cozies for my son, which you can find here. 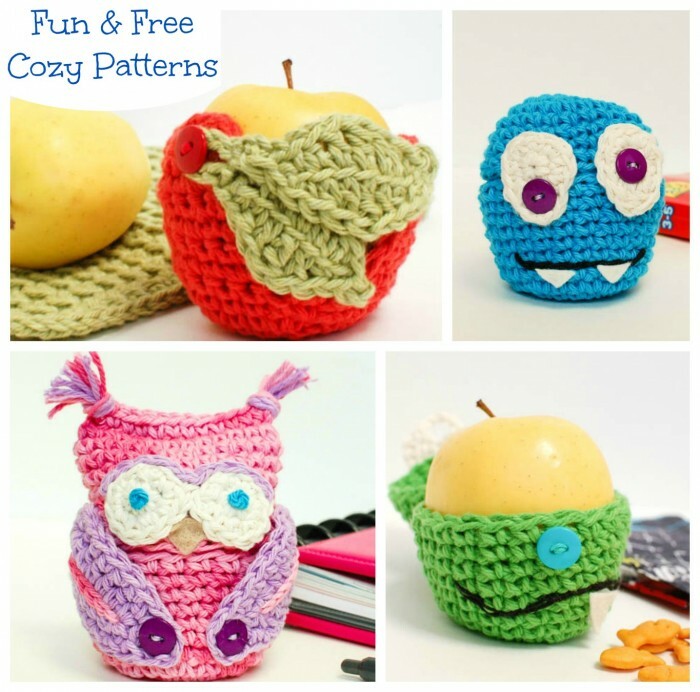 So now I wanted to make one just for me … and since I’m slightly owl-obsessed this crochet owl cozy is perfect for me! With main color, make a magic ring (as an alternative to the magic ring, you can ch 4 and join with a slip stitch in furthest chain from hook to form a ring). Rounds 5 through 11: Ch 1, work 1 sc in same st as join and each st around, join — 24 sts. Fasten off, leaving a tail of approx. 6 in. With main color, ch 24, join with a Sl st in furthest ch from hook to form a ring. Round 1: Ch 1 (does not count as st here and throughout), work 1 sc in same ch as join and in each ch around, join — 24 sts. Rounds 2 through 8: Ch 1, work 1 sc in same st as join and in each st around, join — 24 sts. Fasten off, leaving a tail of approx. 6 in. Flatten the cylinder. Working through the chain end of your cylinder, close top by joining the yarn through chains and working a single crochet edge across. Fasten off, weave in ends. With white, make a magic ring. Fasten off, leaving a tail of approx. 10 in. Use tail to connect eyes together side by side; use a tapestry needle to whip st together across two stitches. Leave the rest of the tail for sewing eyes onto your piece. With your coordinating color, join yarn on side of right eye and Slip st along top of eyes until you reach the side of the left eye. Fasten off and weave in end. Use your eye color to make a french knot in the center of each eye. With your coordinating color, ch 8. Round 1: Work 1 sc in second ch from hook, 1 hdc in each of the next 5 ch, 3 sc in last ch do not turn; working across opposite side of ch, 1 hdc in each of the next 5 ch, 2 sc in last ch, join — 16 sts. Round 2: Ch 1, work 2 sc in same st as join, 1 sc in each of the next 7 sts, ch 4 (button loop made), 1 sc in each of the next 7 sts, 2 sc in last, join — 18 sts and button loop. Fasten off, leaving a tail of approx. 6 in. for sewing wings onto your piece. If desired, embellish each wing with your main color by working a surface stitch across center of wing. Make little fringe tufts for the ears by cutting 6 lengths of yarn each measuring 4 in. long. Holding the strands together, fold them in half to form a loop on one side. Insert hook into the top corner, from back to front, and pull through the loop just enough to be able to pull the ends of the yarn through. Tug gently to tighten. Using a tapestry needle and the long tails, sew top and bottom together along 6 sts only forming a hinge on which the top will open (this will be the back of your cozy). Sew the eyes to the front of the top piece as shown above. Attach each wing to the top piece beside each eye as shown. Find button placement on your bottom piece in relation to your button loops and sew buttons into place. Weave in ends. Add a small felt triangle for the nose or you can embroider one instead if you prefer. Clockwise from top left: Apple (this post), Blue Monster, Green Monster, Owl. Thank you, Kim. These thieves are awful! But seriously, your pattern is adorable, it is a little hard to follow (I.E. “Fasten off, leaving a tail of approx. 6 in. Flatten the cylinder. Working through the chain end of your cylinder, close top by joining the yarn through chains and working a single crochet edge across. Fasten off, weave in ends.” That confused me a little and I ended up joining the top, not the chain portion, and I weaved in ALL ends there, so when I got to the joining part, I only had a small bit of yarn to join the top and bottom), but it was a ton of fun to make! is the H hook the 5mm? My owl does not look big enough to hold an apple, so I wanted to make sure I had the right hook. Thanks so much for sharing free patterns. Looking forward to seeing more of your work! Wonderful pattern. I made a lavender filled owl stuffy for my daughter loosely based on this pattern. I used a J hook. I added an increase row to make it 30 sc across. I added more rows to lengthen it and gradually decreased sc to 18 across. I lengthened the wings by 2 ch. I also crocheted the beak. Turned out super cute. My daughter loves owls. Hopefully it’ll be a keepsake for her for years to come. Thank you for sharing the pattern. Just too cute Kara! I featured it on Moogly this morning! Lovely idea, perfect for back to school!!! Love this, but don’t crochet. Do u have this in a knitting pattern? Cute cozy!! :) thanks for sharing! !